Failure to complete 70% of the registration number, many cars are "cut off" by the Hanoi Department of Transportation. Bus station Giap Bat is always crowded with long distance buses. photo: Ngoc Thanh. 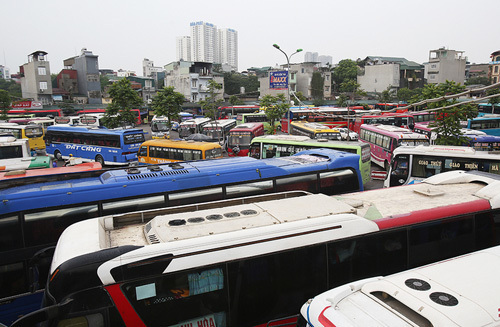 The Hanoi Department of Transport has just asked the Hanoi Bus Station to refuse to serve a month with more than 100 cars. The reason is that these cars are registered to run on a fixed route, but do not perform 70% of the approved voyages. On May 17, Mr. Nguyen Anh Toan, Managing Director of the Hanoi Bus Terminal (My Dinh Bus Terminal, Giap Bat, Gia Lam) said, in essence, that these buses ceased to work, they will not agree that refusal of service or cutting is just formality and text. Mr. Toan explained that "because there are so many engines that register one line, the offer exceeds demand". According to Hanoi Bus Terminal statistics, during the two summits (12/2018 and 1/2019), Bus Station Giap Bat has 66 transport units with more than 100 registered vehicles with a travel number of less than 70% stated. Of these, almost 30 transport units were inactive for months. In early 2017, in order to avoid traffic congestion in the interior of the city, Hanoi has relocated dozens of motorcycles driving from Nam Dinha, Thai Binh, Ha Tinh and Nghe An Route … from My Dinh Keys (Pham Hung 3 Nam Tu Liem Roundabout ) to welcome guests to the Nuoc Ngam Pier (Giai Phong Street, Hoang Mai District), about 15 km from the old pier. Many companies, after moving to Nuoc Ngam dock, had serious business operations. Full-time guests after the resettlement of each vehicle will only be 2-3 passengers. Because of the shortage of customers, many vehicles operate moderately, or catch passengers along the road causing traffic jams and nuisances. In addition to refusing to serve more than 100 vehicles, the Hanoi Transport Department also asked departments to transport other provinces and cities to relinquish badges with hundreds of vehicles from numerous transport units; directing the relevant departments to track the way to discover vehicles that deliberately make a mistake, stop, return passengers, embark and disembark goods in contravention of the rules for returning badges.